In 1993, Our Holy Father, Pope John Paul II expressed the desire to spread Perpetual Adoration, with permanent exposition of the Blessed Sacrament in all parishes and Christian communities throughout the world. In the great Jubilee Year of 2000, He called us to make the Eucharist more known, loved and adored than ever before. He said, "May our adoration never cease!" This is precisely what Perpetual Adoration is; adoration that never ceases. Since December, 2007, with the exception of severe weather and Holy Mass times, Jesus in the Blessed Sacrament, has been adored every hour of the night and day in the Adoration Chapel at St. Joseph's Parish in Grand Rapids, MN. To make this happen, many people commit one hour of their week to be with Jesus. It is an hour for which they will be most grateful throughout eternity. Other people participate as substitutes, filling an hour just for that week for someone who is away or ill. Many others simply take some time out of their day to drop-in for a visit. All are important to the life of the Adoration Chapel! "The best, the surest and the most effective way of establishing everlasting peace on the face of the earth is through the of Perpetual Adoration of the Blessed Sacrament." "In Eucharistic Adoration we meet the merciful love of God that passes through the Heart of Jesus Christ." "Remaining in silence before the Blessed Sacrament, it is Christ totally and really present whom we discover, whom we adore and with whom we are in contact." 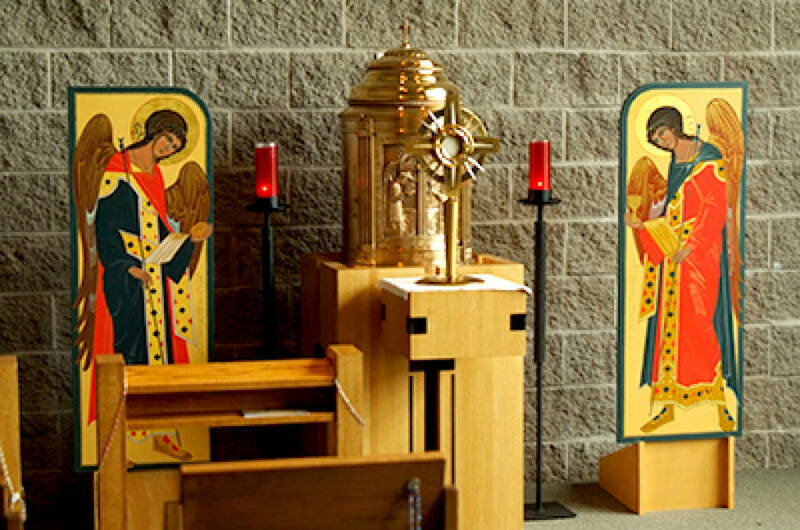 There is always a need for new people to commit one hour of their week to be in the Perpetual Adoration Chapel. We often have extra hours to fill. Perhaps you could help by signing up for an hour. Please check our weekly bulletin or sign-up sheet at the entrance to the chapel.